Ten years ago, Honda introduced a new type of vehicle to America – the hybrid. While it reportedly managed 70 mpg thanks to an extremely light-weight design and a fuel-stingy 70 horsepower motor, global sales only came to around 18,000 units. And that’s over seven years. A quirky, ahead of its time design, a tiny stature in a land of giant SUVs and less expensive gas all conspired to hinder the Insight’s success, but Honda wasn’t one to give up easily. This time Honda is back in the game with a second generation Insight, and they have set their sights on the extremely successful Toyota Prius. Can the Insight topple their rival’s king of green? Oh, yes. Honda needed to make the Insight less expensive, more comfortable and more powerful than the Prius, and it seems they have succeeded. The Insight offers all the drivability of a regular gasoline vehicle and the fuel-economy benefits of a hybrid. An all-new Eco Assist program helps you get the absolute most out of every drop of fuel in a fun and easy-to-use way and the interior is comfortable enough for serious road trips. It’s like an everyday version of their FCX Clarity. Unlike the Prius, the Insight is never completely powered by its electric motors. Instead, the 13 horsepower, 58 lb-ft of torque unit simply lends a hand to the gasoline engine. While that doesn’t hurt our feelings any, diehard electric-vehicle fans and Insight loyalists may be disappointed. We say bully to them, but get over it. Also, while there is a good amount of room inside, taller individuals might find the back seat a tight squeeze due to the raked roofline. On the surface, driving the Honda Insight doesn’t feel too different from driving a standard Civic, which is a good thing, as sometimes hybrids tend to overcompensate for better mpg with a ride that is somewhat disappointing and, shall we say, lacking. Power is more than sufficient, even with a full load of passengers and cargo thanks to the Insight’s robust 1.3-liter four-cylinder engine and its 13 horsepower electric motor. The sizeable front windscreen provides fantastic front visibility, though the C-pillars make for hefty blind spot. 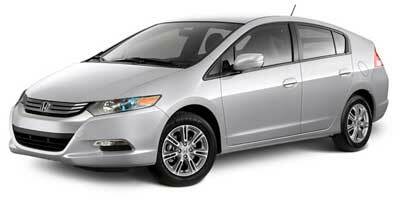 As with most Hondas, the Insight is comfortable and clean thanks to a well-designed and ergonomic interior. The ride is smooth and comfortable due to the car’s well-judged suspension, and cabin noise is kept to a minimum. Here’s where the Insight really holds its own. As we’ve mentioned, this Honda’s primary source of power is a 1.3-liter four-cylinder engine that produces 98 horsepower and 123 lb-ft of torque. A 13 horsepower, 58 lb-ft of torque electric motor powered by Nickel Metal Hydride batteries assists in scooting the Insight down the road. A continuously variable transmission puts the power to the front wheels. While the drivetrain may not be as advanced as the Prius, the Insight will undercut the Toyota in price and have better performance. The 2009 Honda Insight comes standard with an “economyâ€ mode. By pushing a button on the car’s dash, the engine computer adjusts a number of vehicle parameters, including how the air conditioning, transmission and fuel system perform. The changes help to squeeze every last mpg out of this hybrid. Also, and it comes with Honda’s Eco Assist driving educator, which displays just how “greenâ€ your driving is via the speedometer’s color. The greener you drive, the greener the gauge, the less green you drive, the bluer it glows. Trying to get green is like a Wii game, simple and fun to use. Just like the first Insight, the second-generation brims with the entire arsenal of Honda’s technology all tasked with keeping fuel consumption to a minimum. This time, it’s a vehicle you can live with on a daily basis. The tech extends from the car’s slippery shape designed to reduce drag to the vibration-inhibiting body. Unlike the first-gen car, however, this Insight is packed full of creature comforts, from a 160-watt audio system to satellite navigation to well, a backseat, four doors and an un-toy-like feel. Honda predicts its new hybrid should be able to muster 40 mpg city, 43 mpg highway. While those numbers are more than respectable for a five-passenger car, they do fall a bit short of the Prius’ 48 mpg city, 45 mpg highway. We haven’t heard word yet as to whether or not the Insight will be available for any of the same tax incentives currently available for the Prius, but if it is, they should help to offset some of the losses at the pump. Inside, occupants are treated to the same high-quality fit and finish we’ve come to expect from Honda. Materials are durable without feeling cheap, and the two-tier dash is smart looking and clean. The design offers up crucial information like vehicle speed on the top level, while less pertinent information is displayed down below. We’d opt for the navigation screen too. The Insight’s design hasn’t changed much at all since the world caught the first glimpses of the original concept. Just like the Prius, the car’s styling has been dictated by necessity of keeping a low coefficient of drag. In this case, that means a somewhat odd, but incredibly aerodynamic exterior design. It may look like an egg, but that is part of the Insight’s charm. With a base price of $19,800 for the LX, the Insight is the most affordable hybrid on sale in America. That means the price tag hits below the Prius’ $22,000 MSRP. The EX trim reaches $21,300 to start and adding navi will top it out at $23,100. Other contenders for low-end hybrids include Honda’s own Civic Hybrid sedan at $23,650 and the Nissan Altima Hybrid at $26,650. Honda has promised production numbers for the 2010 Insight to fall in the 100,000 range, and given the hybrid craze currently gripping America, we can guess the car will sell well here. It delivers great fuel economy and an easily identifiable image without sacrificing any of the drivability of a standard gasoline car. While certainly not perfect, this Insight’s low price tag and Honda’s good name should do much to wile would-be Prius owners off of Toyota’s lots due to the lower price and wow factor. We feel the Insight could be one of the cars of the year. The 2010 Honda Insight comes with plenty of neat tech, including Eco Assist. The system interprets a number of variables to determine just how green the car is being driven. The car’s computer monitors parameters like engine load, throttle position and fuel consumption to give you a green score. If your driving habits help to get the most miles per gallon out of the hybrid, the car’s speedometer will glow green to reward you. If, on the other hand, hard acceleration and braking are part of the routine, the gauge will glow blue. Keep the speedometer in the green, and you can get the best fuel economy possible out of your hybrid. While it won’t add an extra 20 mpg, it will help you get the absolute most out of the Insight – almost like a an instant visual reminder of all the pennies you’re saving by going easy on the throttle – all while having fun driving down the road. Honda realized that to help people become greener, they need to have a good time doing it.